I’ve been waiting to write this review ever since Mega Man 11 got announced. In fact, much of the speculation in my opinion piece regarding this and Mighty No. 9 gets resolved here. But first let’s back up a little. I feel like I’ve been waiting for this game a very long time, and part of that was due to how Capcom seemed to ignore Mega Man for a period of several years. We can speculate about why they suddenly felt the need to make a big push again with Mega Man 11, but I’d rather talk about my impressions of the game. My goal with this review is to give a fair and unbiased picture of the game, not just be the ravings of a fanboy (though I certainly am one). So, the question is, was Mega Man 11 worth the lengthy wait? Or was Capcom right to ignore the blue bomber for as long as they did? One of the first things that stuck out to me in this game was that Mega Man 11 has a bit more focus on plot than most games in the series. I’ve said before that nobody plays Mega Man games for their plot, and while that’s true, sometimes a little can go a long way, especially when it sheds new light on iconic characters. Specifically, this game gives us a look at Light and Wily in their youth and the precipitating event that splits them apart. It’s easy to see Dr. Wily as nothing more than a cartoon villain, devoid of substance. Here, we see how his ideals conflicted with those of a young Dr. Light, and how the object of that split is put to use as a new weapon in his war on mankind. Back in the day Wily built the Double Gear system, and in this game he captures eight more Robot Masters, reprograms them and empowers them with it. Knowing this would immediately put Mega Man at a huge disadvantage, Dr. Light uses Wily’s prototype Double Gear to enhance him, and you’re off to the races. I liked the inclusion of this mechanic, and found it dramatically affected gameplay. There are two Gears you can activate as you play: Power and Speed. While either is active, a meter will fill up, and when it’s full, you’ll be unable to use either Gear until you cool down. As for what the Gears do, you can probably guess from their descriptions, but I’ll run through it real quickly. The Power Gear makes your basic shots more powerful, and even supercharges the special weapons you get from bosses to devastating effect. The Speed Gear on the other hand makes you go so fast that everything else seems to slow down in comparison. But that’s not the same as you being super fast; it more drains the speed from everything on the screen. This slow-mo effect was very useful as I played, and I found myself using it much more often than the Power Gear. This angry mushroom was one of my favorite new enemies. One of the things I most appreciated about this system is how well it was implemented into the game as a whole. Not just for combat, but for tricky platforming as well. For example, in Acid Man’s stage there’s a section where you’re navigating a spiky gauntlet underwater. I died at first, until I realized I had to use the Speed Gear to slow down my reaction time so I could just avoid getting punctured as I hopped through. I also depended on the Speed Gear to freeze foes when they made themselves vulnerable, as many enemies in the game have an unbreakable shield. However, you can also get past them by hitting most foes with fully charged shots, which will stun them briefly. This brings me to my complaint about the Power Gear. It just didn’t feel as necessary for the general puzzle solving the game confronted you with. There were never any times I had to use it to break an obstruction or open a specific type of door. It just made me stronger, which felt much less important when my other Gear could slow enemies to a crawl. Another new aspect to the game is that you can select your difficulty. I went with Normal, but for those uncertain about their platforming skills, there’s no shame in choosing an easier option, especially since even on Normal, Mega Man 11 is tough. Though you can get through the game in 3-6 hours (my playtime was about five and a half), each level will make you earn your victory. That goes double for the challenging boss fights, which were all delightfully distinct. Other than that, there are many newer series staples, such as purchasing upgrades from Auto and Roll. I found this very handy, as I could always use some spare Bolts to buy E-Tanks and extra lives for especially challenging levels. Though there was one feature I found very problematic, and that was the weapon shortcuts. I’m used to pressing shoulder buttons to switch between my powers, but you can also do it with the right Joy-Con stick. Problem is, I generally played the game portably, and often would accidentally hit the joystick as I played, which would distract me just long enough for something to kill me. Thankfully, you can turn that feature off in the settings, which I quickly did. It’s never a great Mega Man game without great Robot Masters, and Mega Man 11 certainly delivers. I’m still impressed Capcom can keep coming up with names at this point, especially considering how many are iterations on the same idea, such as Fire or Ice. Each of the eight Robot Masters has a totally unique design, and they fight very differently. There’s the suave and precise Tundra Man, who skates around like an Olympic ice skater. Or take Blast Man, who hurls explosives everywhere in a frenzy. One of my favorites was Bounce Man, who jumps around like he’s propelled by rubber bands, flinging his stretchy fists at Mega Man. What I most enjoyed about the boss fights was that each of them will bust out their own Gear-powered attacks when they’re losing, which makes things a lot more challenging. Some examples are when Impact Man uses the Power Gear to transform into a massive threat, or when Fuse Man uses the Speed Gear to zap around trying to electrocute you. They’re all great bosses, especially since each of them is voiced. Yes, some are a bit corny, like the medieval knight voice of Impact Man, or the flamboyant Tundra Man, but I’ve come to expect and appreciate a little silliness in Mega Man. If I want dark and edgy content, I’ll stick to the X or Mega Man Zero series of games. Other than the Double Gear system and difficulty selection, Mega Man 11 plays many things safe. That’s not a complaint, mind you. If a formula works, why change it unnecessarily? That said, there are nice modern flourishes that keep things fresh, such as handy checkpoints in each stage. It’s a good mix of old school challenge and new school streamlining. The game is definitely tough, but never in a way that felt unfair. Sure, I died plenty of times, but usually it was due to not paying attention or reacting fast enough. This happened a lot in Torch Man’s stage as I ran from walls of flames, or in Tundra Man’s stage when I got blown by a gust of wind into a bottomless pit. My only critique is that several of the bosses and mini bosses in the game have a bad tendency to push you into a corner and crowd you. You can avoid this most of the time, but it was frustrating that it happened more than once. If all that wasn’t enough, there are also Challenges in the game to add replay value. There’s a wide variety, from collecting medals to using as few jumps as possible to even a Boss Rush or two. Adding to that are a wide variety of records to unlock, reminiscent of Smash Bros. I appreciate Capcom making sure there’s some replay value, especially since the game can be beaten in under an hour (at least according to one of the records I have yet to unlock). It’s much easier to justify a short game when there’s reasons to keep on playing, other than just wanting to beat the game again. 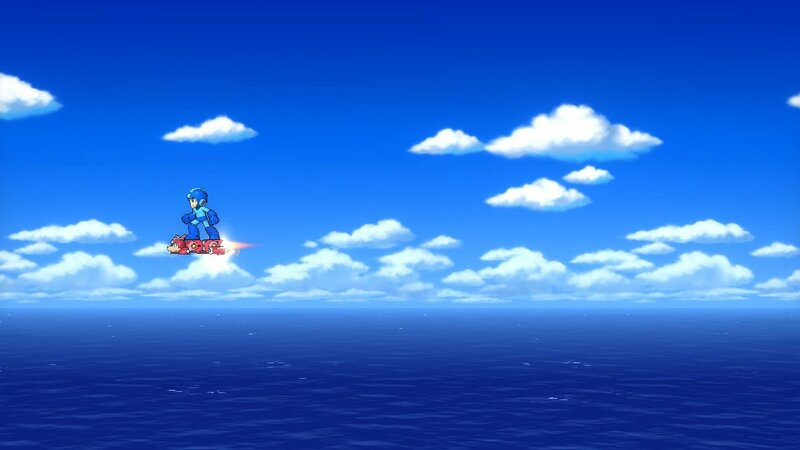 Visually, this is a beautiful Mega Man game. I like to think of it as a mix of the challenge of Mega Man 9 and 10 with the color and style of Mega Man 8. Sure, it’s not 8-bit, but it’s still quite stunning in action. 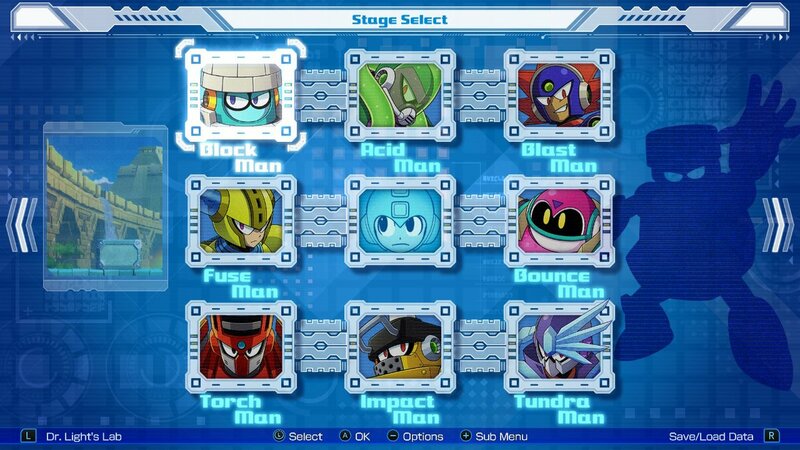 I also appreciated how Mega Man changes his look depending on which power he has equipped (kind of like Beck…). Not just the color scheme, but the look of his body. I also never encountered any slowdown, which is great for this genre. Musically, I had no real complaints. It kept me tuned in, and each level theme was fitting. While I don’t recall any standout tracks, I also didn’t dislike anything I heard. The icing on the cake was the aforementioned corny voice acting for the Robot Masters, as well as Mega Man, Roll, Auto, Dr. Light and Dr. Wily. Mega Man 11 does a good job of showing how such a classic series can hold its own in a modern environment. All in all, I rather enjoyed Mega Man 11, and feel it was worth the long wait. But I have a proviso. I love pretty much everything about this game, but I think it proves Capcom has no more excuses to wait more than two years before the next one. They still know how to make a great Mega Man game, and they can plainly see there is still plenty of demand for them. For $29.99, fans can’t really go wrong with this. It isn’t perfect, and I feel the Double Gear system was a bit half-assed, but it does so many other things right that it’s hard to complain. 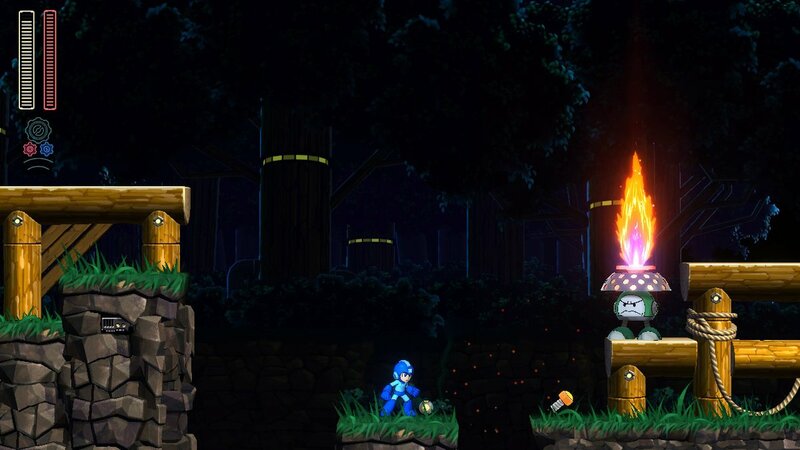 If you’ve been waiting for a new Mega Man game, or just want a great platformer, you can’t go wrong. Nice to see Mighty No. 9 did one thing right.